Morris Plains, NJ ~ The Talk of The Town: Taking Down the Christmas Tree ~ Morris Plains Tree Pick-Up! Taking Down the Christmas Tree ~ Morris Plains Tree Pick-Up! A decorated Christmas tree is all about celebrating the holiday season and being festive. So,it's a sad day when the tree is undressed and ready to be put to the curb for recycling.. which tends to mean the holidays are over! 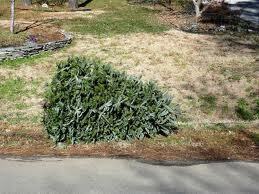 We hope you enjoyed yours and don't forget to put your tree to the curb for the town to pick it up.